Should I file bankruptcy? I started debt consolidation almost five years ago. I pay $400 per month. My remaining balance is $3,500. My condo is under water. My home is worth $300,000. I owe $325,000 on my first mortgage. I owe $58,000 on my second mortgage line of credit. I am seriously thinking about some sort of a bankruptcy to get rid of my second mortgage, which has a monthly payment of $600 (I am current). I am single, and try to live frugally because I learned my lesson about living in credit card hell. I make about $100,000 a year. What do you think I should do? I went to two different lawyers – both recommended Chapter 13 as the best option for me. First off, you are a winner! You win my Question of the Year award. I have never received any other question with such complete, clear, succinct information. You have given me everything I need to give you back a complete answer. 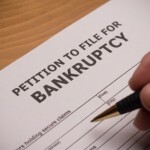 Now for the answer (drum roll, please)…I see absolutely no point in you pursuing a bankruptcy case. If you file for Chapter 13 bankruptcy, you will be able to strip off (get rid of) your second mortgage and make it an unsecured claim. But you will also have to pay what you can afford into a Chapter 13 repayment plan for 60 months. Based on what you are paying now ($600 for your second mortgage and $400 for your consolidation loan), you will be able to afford a monthly Chapter 13 payment of at least $1000 per month. You may be able to pay more into your plan since you live frugally. Over the life of your Chapter 13 case, you will probably pay enough into your plan to pay off your debts in full, including that stripped off second mortgage (which will be treated like an unsecured debt in your plan). The only advantage in filing for Chapter 13: You can repay the remaining debt, including your second mortgage, without paying more interest. mandatory credit counseling cost of around $25. This means your total cost of filing for Chapter 13 will be approximately $12,000. That should pretty much outweigh any possible savings you would see by eliminating interest on the debts under Chapter 13. Delay in rebuilding good credit. There is another thing to consider. You are just now coming out of a five- year debt plan. Entering another five-year plan means five more years of delay in reestablishing your good credit. My advice? Get the remainder of your consolidation program paid off as fast as you can. If you have some savings available, use it right now to get the old plan finished. As soon as the old plan is finished, devote that monthly consolidation payment to paying extra loan principal each month on your second mortgage. The lawyers who recommend Chapter 13 are putting their own financial gain ahead of your best interests, which is unethical, to say the least. For the benefit of other readers, please don’t get me wrong. Chapter 13 is not a good option for Jay in this situation because he can afford to pay his debts. If his disposable income for debt payments was $200 monthly instead of $1000, a Chapter 13 would be a very good deal for Jay.